Essential plot rundown: In the not too distant future, all crime is legal for 12 hours out of the year and during this time, one family gets some unexpected company. So the trailer for this movie looked terrifying. I was sure it was going to be the scariest movie I've seen in a long time; but it wasn't. It still was really good, just not that scary. The movie starts off promising, building lots of tension. But, once the intruders got into the house, it lost all of its intensity. I was more nervous and scared before the intruders got in than afterwards. It's still a good movie after they break in, just not very scary. And the kids were stupid. Why would you run away and leave your parents? While the movie itself was pretty good, the best thing about it was the concept. As a way to "purge" ourselves, everything is legal for 12 hours. This idea opens up for a wide range of stories. I think it would be interesting to see somebody seek revenge during a purge for something that happened to a loved one in the previous purge. It would also be interesting to see people acting as vigilantes, protecting those who can't defend themselves. There are a lot of possible stories for future movies. I wonder if this will become a franchise. They could even have future installments be anthologies, with 3 or 4 segments about different situations. Another good thing about this movie was that it really made me think. I was putting myself in their situation trying to see what I would do. And I couldn't come up with an answer. A lot of times with movie you think Well, if I was so-and-so, I would just do this... But with The Purge, I had nothing. I couldn't think of any moral decision; I had no idea what I would do. But, the family ends up choosing pretty well I thought. As I was talking about this with my friend on our way home from the theater, we got onto the topic of violence in the media. We discussed whether consuming violent movies/games makes one more violent or if it acted as a catharsis. 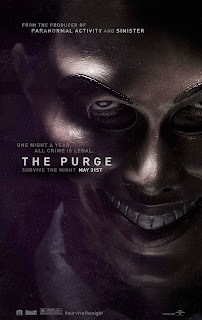 Which made me see The Purge as a metaphor for cathartic violence. In The Purge, people have 12 hours to do what they want. By having this freedom, it decreases the amount of crime the rest of the year. Similarly, watching a violent movie purges you of your violent tendencies, decreasing the possibility of you acting violently in real life. But that is just how I interpreted it. Overall, I really liked it. It did run out of steam by the end but it still works. I would really like to see other movies that take place during the 12 hour purge. Could make for a compelling franchise.